Jeff Lloyd posted this photo from his collection and I just had to repost it here as its such a great shot! 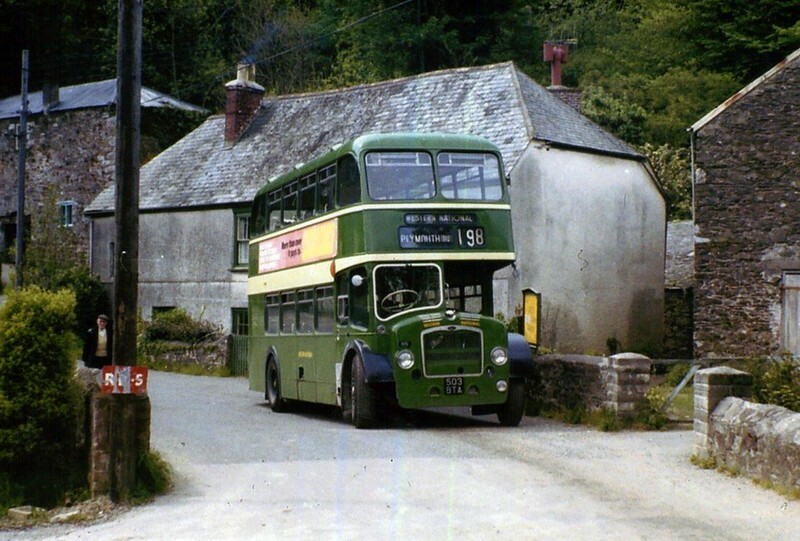 Anyone out there have any idea where this was taken - or indeed where the 198 route went? My first guess was Bridgend at Newton Ferrers (on the hairpin corner where the stream goes under the road). But on second thoughts, the perspective of the picture does not quite match and I doubt you could have got a vehicle of this size down there - and managed to turn it around again at the end! The slate buildings look typical of a small village in the South Hams or South East Cornwall. I think if we knew where the 198 went, it would narrow the location. Photo is without doubt taken in Forder, right at the Southern edge of Saltash, at the bottom of Castle Hill, lovely location, although I don't think anything goes down there anymore, despite there still being marked bus stops! It is Forder, but Brigend was an interesting idea, Width and Length I wouldn't have thought an FLF would have had any issues as I personally drove a full length and width Barbi coloured dart there in the late 90's and did the Brigend turn and reverse at Noss by the tennis courts. Aha, This would also be close to the site of a former railway level crossing ! The Forder Tramway crossed the road around here, although I can't manage to reconcile the buildings in the background of the two pictures. Picture courtesy of the splendid Saltash & Tamar Valley History website. I am not sure why the 198 had such an unusual number. Prior to the opening of the Tamar Bridge it operated from Saltash Station to Forder but was extended to start from Plymouth in 1961. A route number in the 70s would have been more logical. All the Saltash services were extended to Plymouth on their existing frequencies with no attempt to create a clockface service when the Bridge opened. For a while the 198 even diverted via Bridwell Road between Weston Mill and St Budeaux. It was a complete mess and didn't really get sorted until 1987 when new services 1 and 2 were introduced with the 76 running separately.